Lee Petra Grebenau design house is one of Israel’s most prestigious fashion brands known for their hand embroidered details, incredibly high end fabrics and materials (sourced mostly from France) and their Haute Couture take on weddings. Lee does not believe in trends and stands to create timeless dresses with incredible craftsmanship and quality. Headquartered in Hertzeliya, Israel, Lee’s gowns are available internationally for the discerning bride who prioritizes quality and timeless elegance. Part of the reason I fell in love with this dress is that it is so lightweight - compared to many beaded gowns I tried on that had me moving around like a wooden puppet - I felt like I could move and even boogie in this beautiful gown. The beading is subtle and adds just a bit of sparkle in person and in photos. I loved that it felt subtle, sophisticated with just a hint of glam. 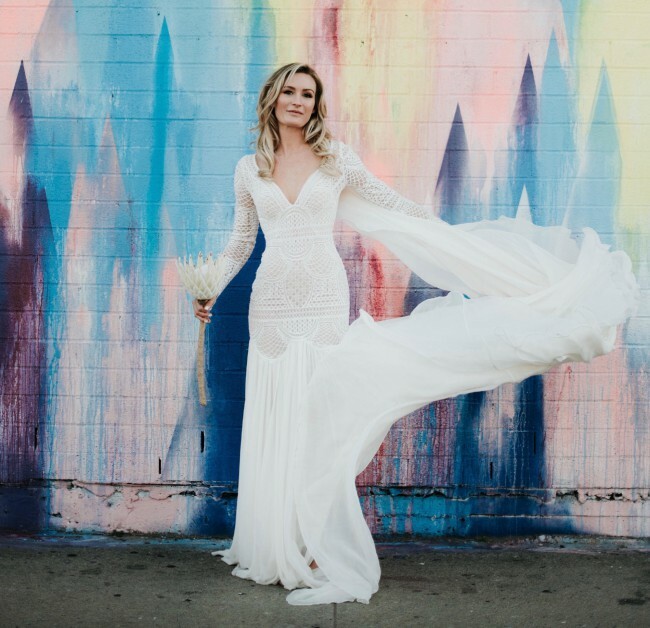 The Chiffon is so lightweight and gorgeous, when it blew in the wind during our photoshoot it created some of the best effects - that I didn't foresee! The gown will be returned from the specialty cleaners in mid May and can be shipped directly afterwards. I had two very thin straps added to the inner bodice to keep the dress more fitted along the cleavage - alleviated the pressure on the delicate shoulders (as they sit just at the edge of your shoulders to give that open back effect. These are structural and sit underneath the dress so they cannot be seen when worn. I also added in an adjustable inner belt (not visible at all from the outside) to help define the waist a bit better. I wanted to emphasize the hourglass element, which really suits the dress, however, this would be easily removable during a fitting. Lastly when the talented Lee Grebenau crew was making it, I requested the addition of extra lace fabric on the sleeves so they end in a beautiful half circle over your hands (message me for a photo!). Once you send a message, Britt can invite you to purchase the dress.